Sony has just unveiled four new headphones in its XB950 (also known as 'Extra Bass') range at CES 2017. As the name implies, these headphones are geared towards providing enhanced bass for (as Sony promises) ‘music you can feel’. 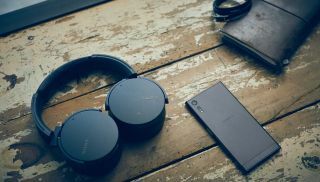 This isn’t just about rattling your brain with thumping bass, however, as Sony is keen to make it clear that it has also worked hard to improve sound quality and comfort as well as cranking up those low tones. All four pairs of new headphones joining the Extra Bass series bring distinct new features, while continuing the line’s focus on premium sound quality and enhanced bass booster technology. Both the MDR-XB950N1 and MDR-XB950B1 are wireless headphones that support Bluetooth and NFC (Near Field Communication) for audio streaming and easily connecting to compatible devices. The two headsets can be controlled with the Sony Headphones Connect app (which will be available to download in Spring 2017), which lets you change the acoustics of your music to emulate different listening environments: Arena, Club, Concert Hall, and Outdoor Stage. You can also use the app to control the bass levels of the headsets as well. The MDR-XB950N1 has added noise cancelling technology and the built-in rechargeable battery offers 22 hours of music playback. Despite not having noise cancelling technology, the XB950B1 provides slightly less battery life, with 18 hours per charge. Both headsets have built-in microphones for taking calls, with the music pausing and resuming when you receive and end a call. The two other new headphones are wired. The MDR-XB550AP are on-ear headphones that come with a premium metal headband and choice of five colors. These larger headphones contain a 30mm driver with a 5 – 22,000 Hz frequency response, and of course the top-of-the-range bass technology that this series has been known for. An in-line remote with built-in microphone gives you control over playback and taking phone calls, and its functionality can be customised with the Smart Key app. Finally, the MDR-XB510AS are in-ear sports headphones that fit the enhanced bass technology into an easy-to-wear and IPX5/7 water-proof design. These headphones come with a range of accessories to help make them feel comfortable at the gym or when playing sport. All four new headphones will go on sale sometime in Spring 2017. Sony has yet to announce pricing and pre-order dates, but we’ll keep you posted as soon as we hear anything.